In the early morning hours of June 22nd, 1941, Axis armies – German, Romanian and Finnish – launched a sneak attack on the Soviet Union, touching off the greatest conflict in human history. Millions of men fought and died in what became known as the Great Patriotic War, which would ultimately end with the Red Army mounting its battle flags over the ruins of Berlin. Defiant Russia is our fast-playing game of the Axis invasion of the Soviet Union, known as Operation Barbarossa. It’s a completely new edition of the game we produced in the early 2000’s: new rules, more pieces, more map, more scenarios, more fun. 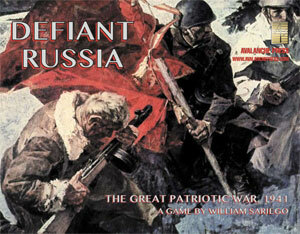 Designed by William Sariego, Defiant Russia puts its emphasis on fast and challenging play. Play is easy; strategy, not so much. The Axis player starts with overwhelming force, but has a stiff set of objectives to meet. The Soviets will usually see much of the seemingly-powerful Red Army melt away in the first turns of play, but powerful reinforcements are on their way. There are 200 playing pieces (the first edition had 140) and a 28x22-inch map (the first edition’s was 22x17 inches). 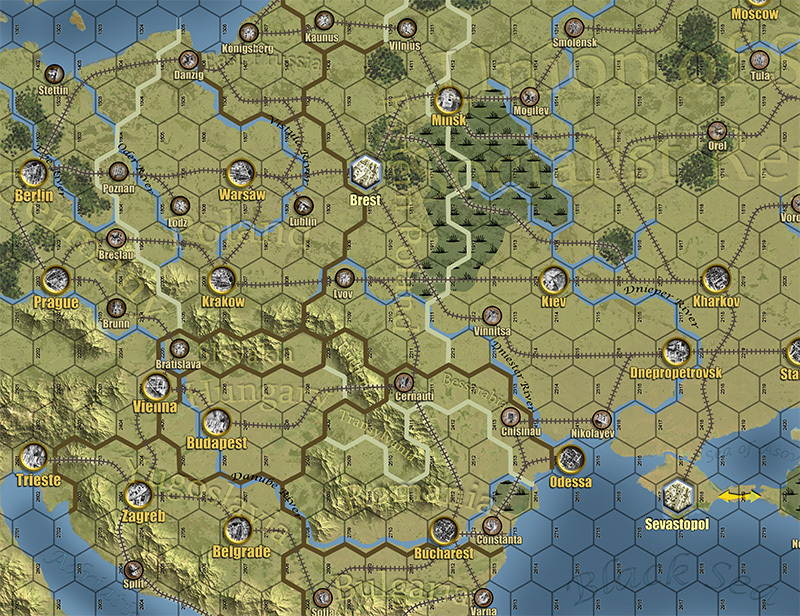 There’s an introductory scenario for the 1939 German invasion of Poland, but the main event is the 1941 Axis attack on the Soviet Union. There are additional scenarios built around Operation Barbarossa plus variations like Turkish intervention. Most Axis units represent corps; there are German, Romanian, Finnish, Hungarian and Italian units on the Axis side. Soviet units are mostly armies; the Soviets start out with a very powerful army but that first Axis turn is rough on the Red Army. The map is by Guy Riessen and extends from Berlin in the west to Kuybyshev in the east, and from Petrozavodsk in the north on down to Kars in the south. There is plenty of room for rampaging. You can download the game rules right here.